Steve Appel, a matter-of-fact kind of man, is happily turning the nuts and bolts of his former profession into a successful career. 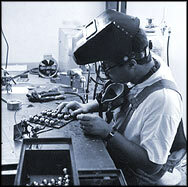 He makes his metal Bolt People® out of nuts, and bolts, ball bearings, and other metal fasteners. 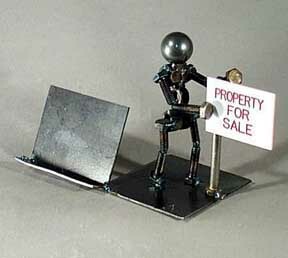 He has over 200 varieties of metal figures doing all kinds of things; from work to recreation. The statues range from cowboys on horseback to hanging sculptures of sky divers, doctors practicing on patients to all kinds of sports figures, musicians, and more. It takes all kinds, that is one key to Appel’s success. Some of the Bolt People® are humorous, others are quite artistic. Steve says that he never imagined that the idea would blossom into such a full-time enterprise, but he is glad it did. 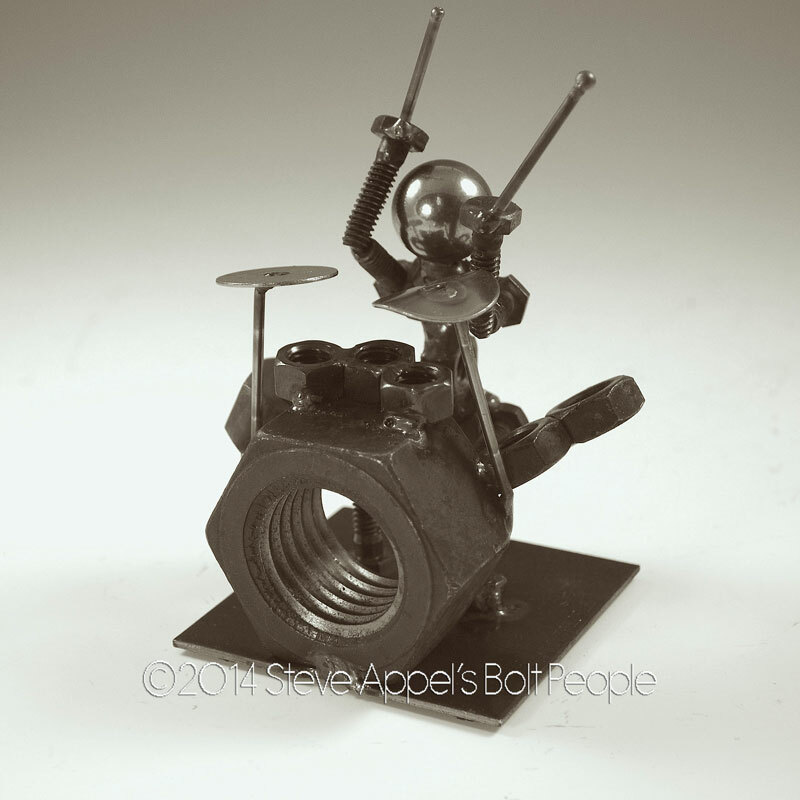 The Beginning of Steve Appel’s Bolt People® . 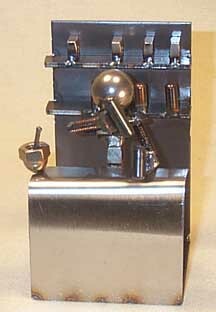 . .
Steve began giving these metal sculptures as gifts to friends and coworkers. They are the ones who told him to start selling them. So, he began selling his Bolt People® at craft shows on the weekends, still holding onto his job at the shipyard. That plan changed when Steve was laid off in 1989. He decided then to make his hobby a full-time profession and broadened his market by doing shows around the country. Steve did over 40 shows his first year as a full-time entrepreneur, and he took a business class through SCORE. Orders started pouring in and the business has grown steadily ever since. Some of Steve’s specialty creations include, a full tennis court with players, a scene with a guy sitting in a chair watching TV, seven kids running around the room, and his wife about to beat him over the head with a rolling pin. 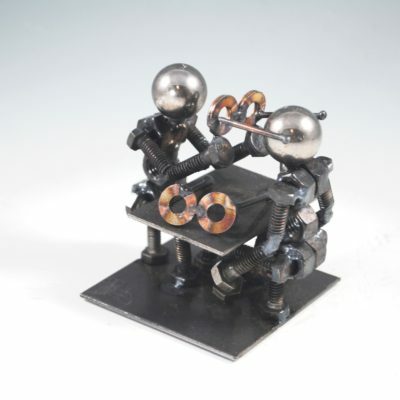 Perhaps one of Appel’s most intriguing pieces is of metal people playing pool. Even the pool table is detailed with balls and pockets.